Kids can dress up in Revolutionary-inspired clothing at the Museum of the American Revolution. Two hundred and forty years ago, the Continental Army trained to take on the British Army after a long, harsh winter at Valley Forge. From Saturday, March 24 through Sunday, April 8, at the Museum of the American Revolution, visitors can explore what life was like for the army during the spring of 1778. There will be special demonstrations on early-American trades and skills like shoemaking and fencing, as well as family-friendly activities, to celebrate many local schools being on spring break. All spring break programs are included with regular museum admission. Check the list below to find out which demonstration will be happening each day from 11 a.m. to noon. • Women at War: Learn about Revolutionary women who sewed flags, rolled cartridges and even went to war. A costumed historical interpreter will demonstrate how to roll cartridges (March 24, April 2 and April 6). • If the Shoe Fits: Follow in the footsteps of an artificer who will demonstrate the process of shoe-making for the Revolutionary Army (March 25, April 5 and April 8). • Clothing the Army: Explore how the army uniformed thousands of troops. Visitors will be able to put some stitches in a uniform like those destined for Continental soldiers (March 26). • Camp Followers: Learn how women and children took risks to accompany Revolutionary armies as camp followers. Test how many essentials women could carry in their knapsacks and market wallets during their wartime travels (March 27 and April 1). • Forged in Philadelphia: Witness the skills that went into making a Revolutionary firearm. Visitors can take a closer look at a reproduction weapons and learn about the blacksmith business (March 28, April 4 and April 7). • The Art of Fencing: Learn basic fencing skills that were used in Revolutionary-era times. Learn about two fencers who would have lived in the museum’s neighborhood (March 29 and April 3). • All Dressed Up - Gown-making in Revolutionary Philadelphia: Experience how women in Revolutionary Philadelphia ordered custom gowns. Jana Violante, dressmaker and living history interpreter, will demonstrate and discuss gown-making techniques (March 30 and March 31). 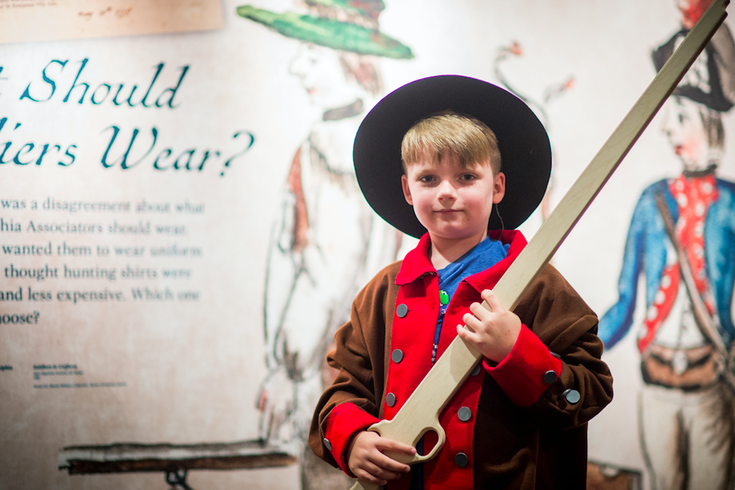 In addition, kids can try on Revolutionary-inspired clothing, decode secret messages and practice drilling like a Revolutionary soldier.